Separate dough into 8 rolls. Reserve icing. Press rolls in bottom of pan. Drop marmalade by teaspoonfuls evenly over dough. In medium bowl, mix flour and sugar. With pastry blender (or pulling 2 table knives through mixture in opposite directions), cut in almond paste and butter until mixture looks like fine crumbs. Sprinkle evenly over dough. Place tart pan in oven on pan with sides. Bake 25 to 35 minutes or until golden brown. In small microwavable bowl, microwave icing on High 10 to 15 seconds; stir. 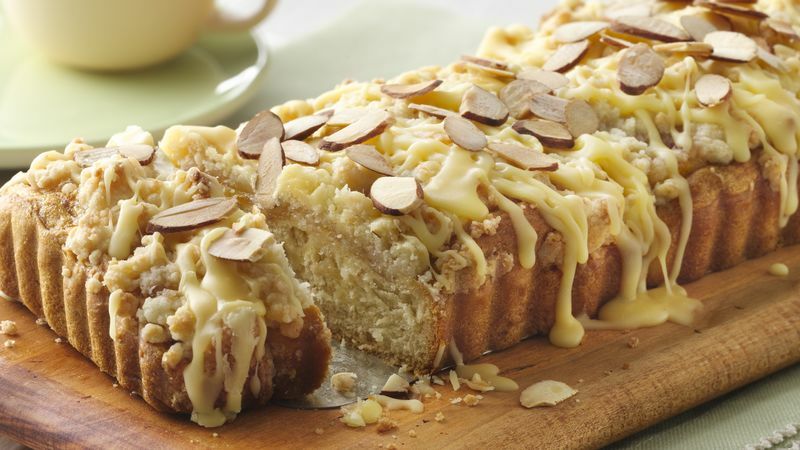 Immediately drizzle over coffee cake; sprinkle with nuts. Cool 20 minutes. To toast almonds, heat oven to 350°F. Spread nuts in ungreased shallow pan. Bake uncovered 6 to 10 minutes, stirring occasionally, until light brown. For ease in cutting, use a serrated knife.